Remotely operated vehicle (ROV) Doc Ricketts completed its one thousandth dive on December 21, 2017, marking a significant milestone for the vehicle and its team of pilots. Since it began operations in February 2009, Doc Ricketts has explored the deep sea as far north as the Juan de Fuca Ridge off the Pacific Northwest coast and as far south as Baja California, Mexico. ROV Doc Ricketts is launched through the moon pool of its host ship, the R/V Western Flyer. The ROV’s thousandth dive could not have taken place in a more picturesque place. 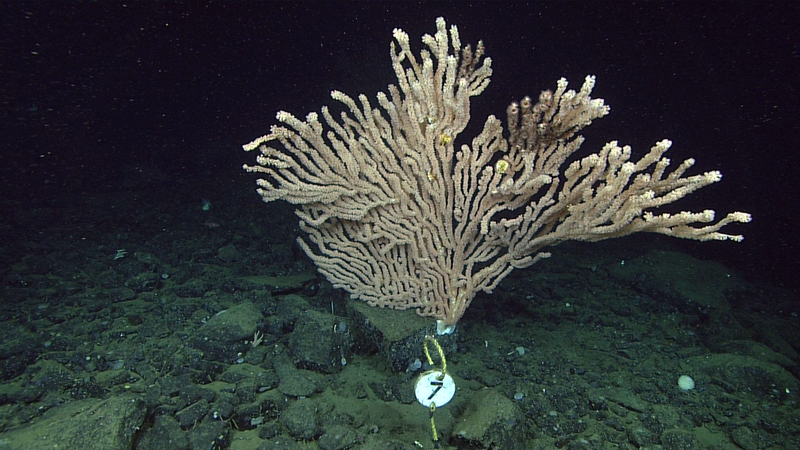 MBARI researchers and scientists from the Monterey Bay National Marine Sanctuary were revisiting an area called Sur Ridge, an underwater mountain about 37 kilometers (23 miles) off the California coast. During the dive, Doc Ricketts was monitoring deep-sea corals 1,281 meters below the surface. A deep-sea coral (Keratoisis sp.) seen during dive 1,000 at Sur Ridge. The ongoing studies of deep-sea corals provide important information about the role these animals play within the biological communities they inhabit. Researchers monitor size, age, growth, reproduction, and symbiotic relationships with other animals (including predation). 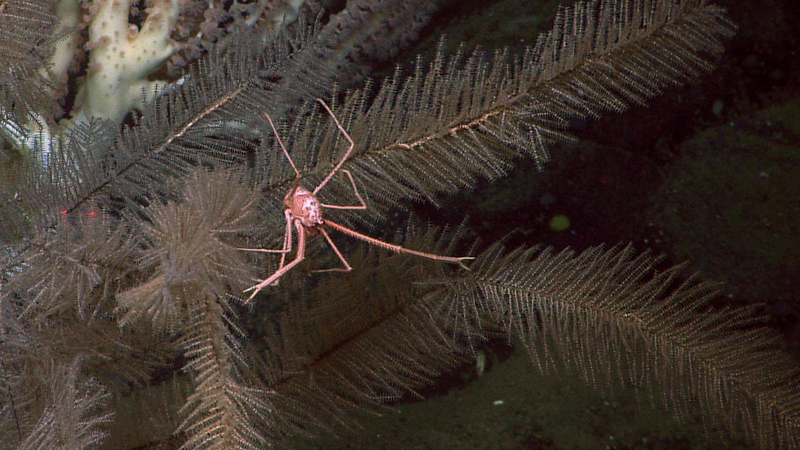 A crab (Gastroptychus iaspis) on a black coral (Lillipathes sp. ), also seen during the thousandth dive. In addition to the ship’s crew, technical and engineering staff play a major role in the success of MBARI’s marine operations. 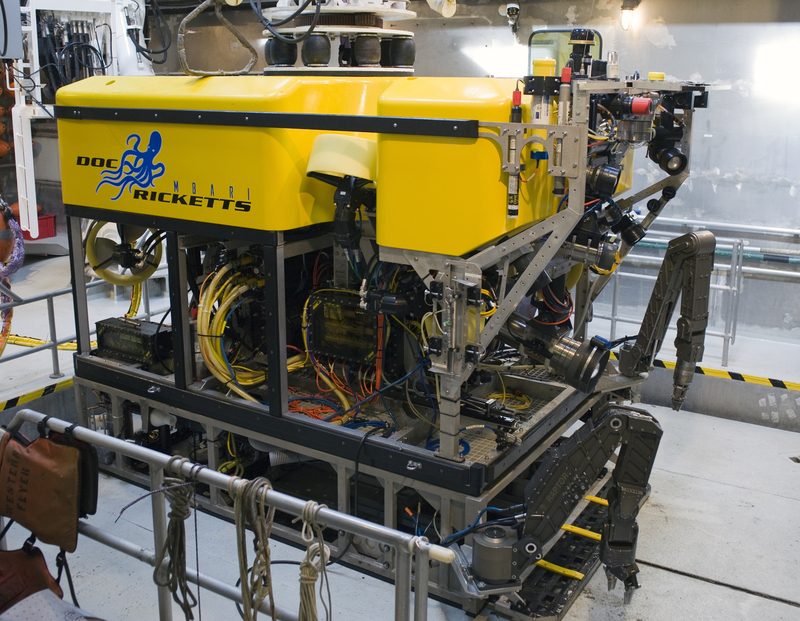 MBARI looks forward to the exploration and discovery Doc Ricketts’ next thousand dives will bring. March 23, 2018 – A recent issue of Oceanography magazine includes ten articles that highlight a few of MBARI’s accomplishments, as well as ongoing research and development. Feb 7, 2018 – ROV pilot Ben Erwin is using virtual reality as a new tool for deep-sea exploration. December 26, 2017 – Remotely operated vehicle (ROV) Doc Ricketts completed its one thousandth dive on December 21, 2017, marking a significant milestone for the vehicle and its team of pilots.